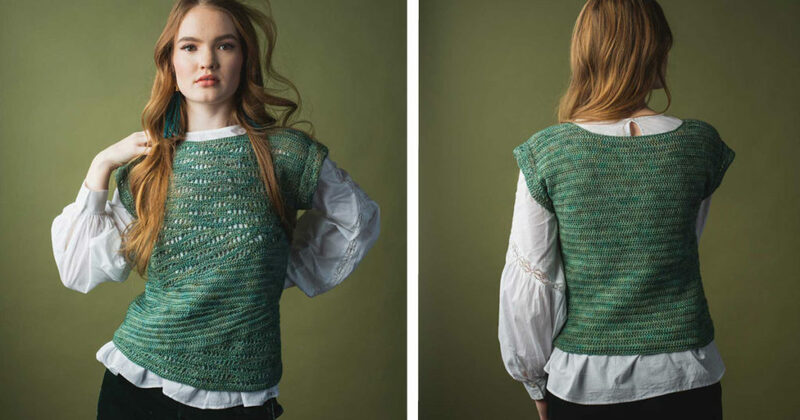 The little lacy waves in the Vilnis Top in Interweave Crochet Spring 2019 caught my eye right away. I was even more delighted to realize that because of the sizing of Linda Skuja’s design, plenty of us can wear it this spring. The pattern sizing spans an impressive 15″, making it one of my new favorite plus size crochet patterns. 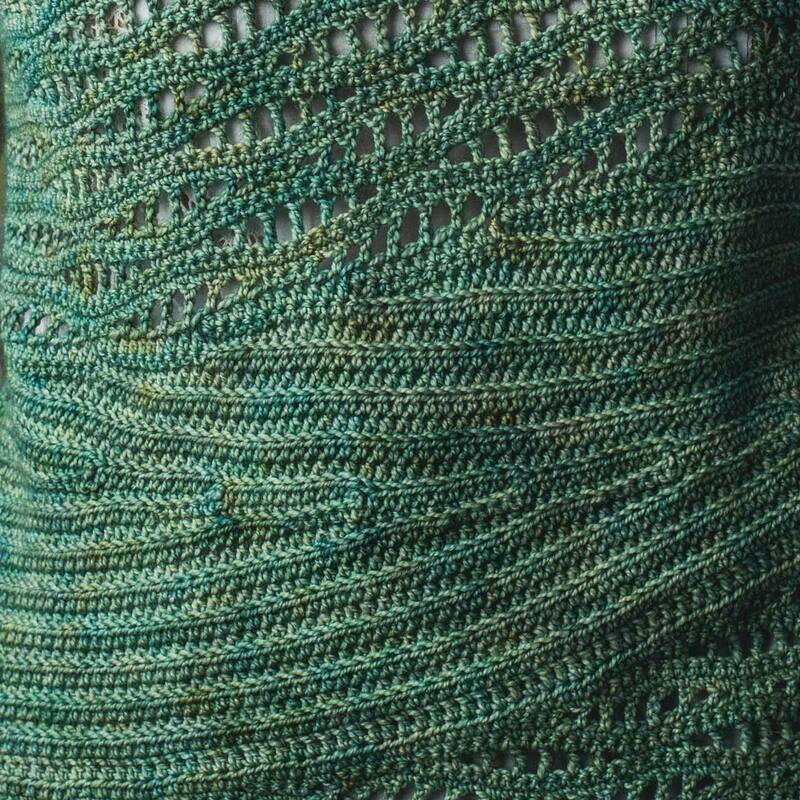 Vilnis is a Latvian word for “wave.” In the Vilnis Top’s construction, short-rows create the asymmetrical lines that rock back and forth across the front from the bottom up. When you’re working short rows, you work only the specified number of stitches in each row, leaving the remaining stitches unworked. Combined with the boxy silhouette, this structure creates flattering diagonal lines and interesting geometry. The stitch pattern on the front and sleeves makes a different kind of wave. An easy sequence of stitches from short to tall and back creates open, lacy areas. Some of my other favorite plus-size crochet patterns are in Colorful Crochet Lace by Mary Jane Hall. And Rohn Strong has a great tutorial on Full Figure Flattery: Tips to Modify Patterns for a Great Fit that helps you choose (and tweak) a sweater design. The front and back are worked separately from the bottom up and seamed at the shoulders. The sleeves are seamed to the garment with the underarm and side seams worked as one long seam. FINISHED SIZE 35 (38, 42, 46, 50)” bust circumference. Sample shown measures 35″, modeled with 1″ negative ease. YARN Knit Picks Hawthorne Tonal Hand Paint (80% superwash fine Highland wool, 20% polyamide; 357 yd [326 m]/31/2 oz [100 g]; ): #27412 Springfield, 3 (4, 4, 5, 5) skeins. HOOK Size G/6 (4mm) (affiliate link). Adjust hook size if necessary to obtain correct gauge. NOTIONS Stitch markers (m) (affiliate link); yarn needle. GAUGE Front: 211/2 sts and 273/4 rows =4″ in Open wave & short row patt; Back: 20 sts and 12 rows = 4″ in dc. Featured Image: Vilnis Top by Linda Skuja. Photo by Harper Point Photography. Crochet Tops for Every Type!